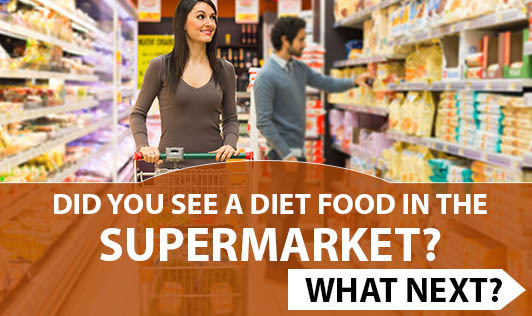 Did You See A Diet Food In The Supermarket? What Next? The weight loss industry is a multicrore rupees franchise offering consumers everything from exercise equipment to workout videos and self-help books to nutritional products. Buying a diet or a health food can be tricky as it can affect your health in a major way. To learn which one is right for you, do some research. Claims and reviews: Read consumer reviews of each product. Look for independent reviews on websites that do not sell the product and are also not biased in their opinions. You may find comments on taste, ease of cooking and other helpful information. Serving sizes: If you want to purchase food and drink product, then please make sure you read the nutrition labels. To make valid comparisons, start with the serving size. Compare the total calories per serving of products you are comparing. Nutritional breakdown: Check the percentage of the food or drink that comes from carbohydrates, proteins and fats. If you plan on relying on only one or two food items for your daily caloric intake, then it's important to know if you'll need to supplement them with other items to get the correct balance of nutrients you'll need each day. Sometimes the manufacturers highlight only one particular nutrient as an enhancing factor and leave out the rest. For example: If you are buying any digestive biscuits, the highlight is only the fibre content but the fat percentage (which is usually high) is left out. Please consult a dietitian to know more about the diet foods. Fat types: Read the labels to compare the amounts and types of fats. Avoid products with more saturated and trans-fats. Check the amounts of additives, preservatives, artificial colours and sweeteners. If high when compared to your regular products, then be careful before you consume. Make sure you do proper research before you consume any diet food! If you want us to do a review of the products you know, please suggest us!